What is the RMD formula? What time of the year are distributions due? Enter the combined total of all qualified retirement plans as of 12/31 of the year prior to the distribution year. Select your age as of 12/31 of the distribution year. If you are 70 years old and your birthday falls after June 30th, select the "70-1/2 after" option. Or, if you are 70 years old and your birthday falls before July 1st, select the "70-1/2 before" option. If your spouse is the sole beneficiary and is more than 10 years younger than you, enter the age of the spouse as of 12/31 of the distribution year. Otherwise leave this field blank. Based on your age and the life expectancy table your situation applies to, this is the distribution factor the calculator found in the table. This is the entered IRA balance divided by the distribution factor in the previous row. This online IRA RMD Calculator will estimate your required minimum distribution if you are an IRA owner age 70-1/2 or older. Plus, the calculator will even tell you which IRS Life Expectancy Table it used in case you would like to look up the distribution factor yourself. If you are age 70-1/2 or older, and would like to forecast your withdrawals for several years into the future, see the IRA Withdrawal Calculator. Otherwise, if you are younger than age 70-1/2 and would like to forecast the effect RMDs will have on your retirement, please use the IRA Distribution Calculator instead. If you're not sure what RMD is, or if you want to know what the calculator bases its calculations on, be sure to visit the Learn tab for answers. Important: Please keep in mind that the results of this calculator are merely estimates and are not to be used for calculating your actual distribution amount. Consult your plan administrator for the exact amount required. Enter the IRA balance as of December 31st of the year prior to the distribution year. Select your age as of December 31st of the distribution year. If your spouse is the sole beneficiary and is more than 10 years younger than you, enter your spouse's age as of December 31st of the distribution year. Otherwise leave this field blank. Click the "Calculate RMD" button. This will look up and display your distribution factor and then calculate the distribution amount based on that factor. Minimum distribution basics and the RMD formula. Minimum distribution requirements come into play when an owner of a qualified retirement plan reaches age 70-1/2, or when a beneficiary assumes or inherits and IRA from the deceased owner. The withdrawal for the first year of the distribution can be deferred to the following year (for tax purposes), but must be withdrawn before April 1st. After that withdrawals must me made prior to December 31st. The penalty for insufficient distributions is 50% of the undistributed amount. In order to calculate the amount of your required minimum distribution, you first need to look up your life expectancy factor in the IRS life expectancy tables. Once you find your life expectancy factor, you then divide the year-end balance of your IRA by that factor. The result is the amount you are required to withdraw from your IRA by the end of the current year (or April 15th of the following year if this is your first year of making required withdrawals). IRS Life Expectancy Tables are three tables provided by IRS Publication 590-B for determining minimum distribution requirements for qualified retirement plans. The three tables are Single, Joint Life and Last Survivor, and Uniform Lifetime. 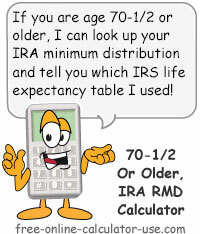 The IRA RMD calculator is based on Table II (Joint Life and Last Survivor Expectancy) and Table III (Uniform Lifetime) Table from IRS Publication 590-B (2014) (opens new window). If your spouse is the sole beneficiary and is more than 10 years younger than you, Table II is used. If you are unmarried or your spouse is not more than 10 years younger than you, or your spouse is not your sole beneficiary, Table III is used. In either case, the calculator will indicate which table it used in the displayed results.